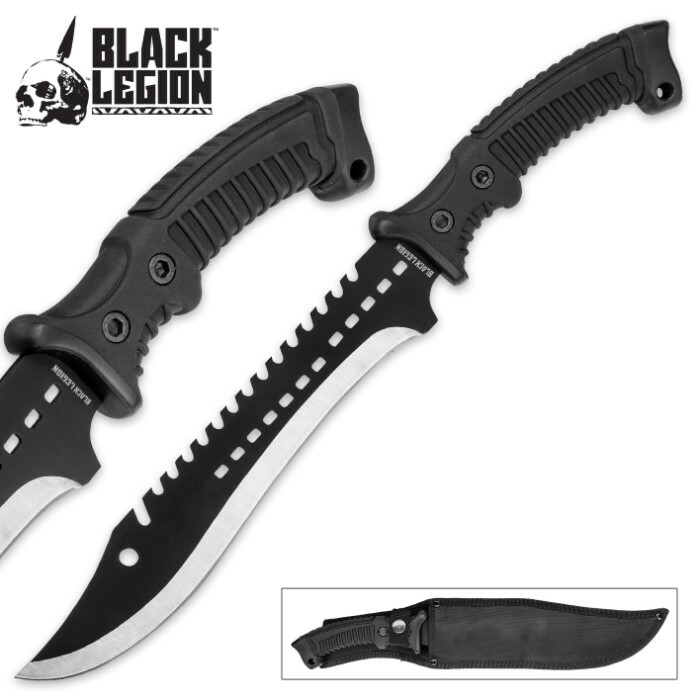 Black Legion Iron Phantom Bowie / Fixed Blade Knife - 3Cr13 Stainless Steel - Clip Point, Sawback, Black 2-Tone Finish - Belt Sheath - Tactical, Outdoors, Hunting, Survival, Camping - 15 1/4" | BUDK.com - Knives & Swords At The Lowest Prices! 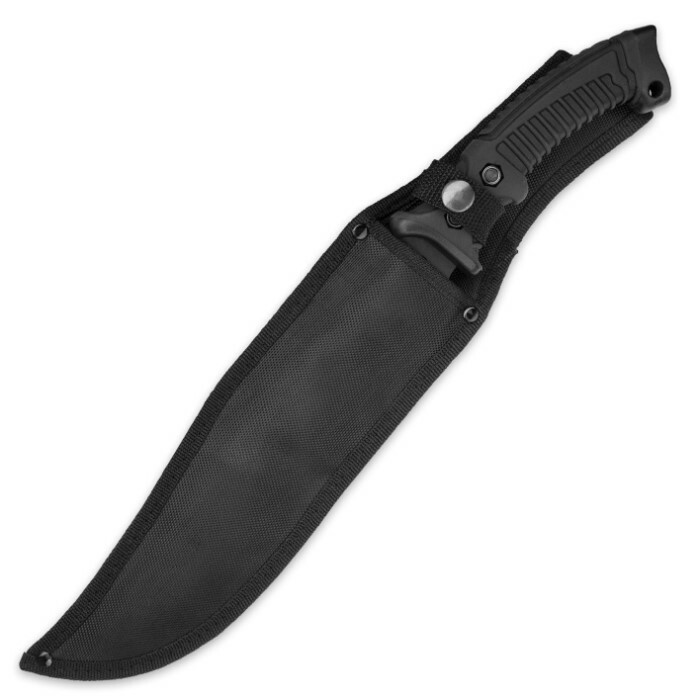 Black Legion Iron Phantom Bowie / Fixed Blade Knife - 3Cr13 Stainless Steel - Clip Point, Sawback, Black 2-Tone Finish - Belt Sheath - Tactical, Outdoors, Hunting, Survival, Camping - 15 1/4"
Black Legion's Iron Phantom Bowie spurns posh appointments and fancy frills - opting for a heaping, extra large dose of raw power and strength, instead. It's built specifically for serious field use - challenging, strenuous cutting tasks in the most extreme environments. Where fancier, more extravagant - and, not to mention, expensive - fixed blade knives fail, the Iron Phantom succeeds - capably, efficiently and discreetly. 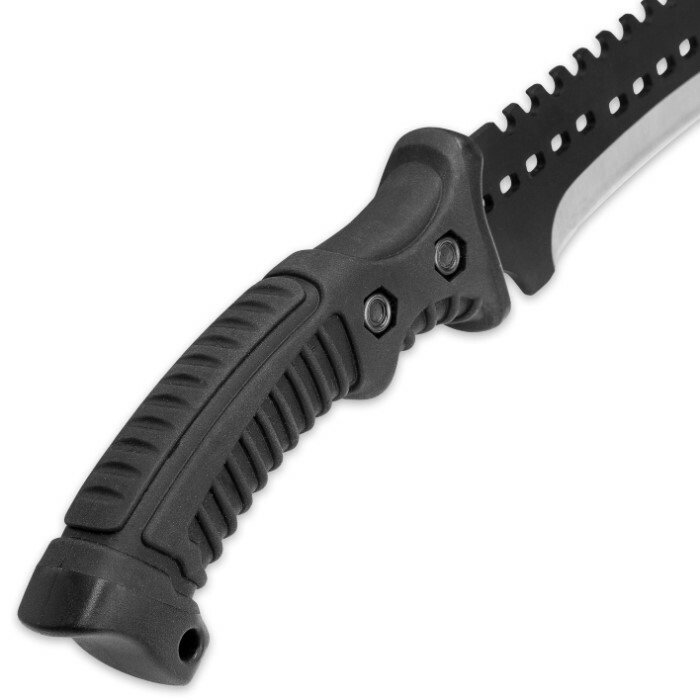 Forged from rugged 3Cr13 stainless steel, the mammoth clip point blade is a savage workhorse. It's armed with a carefully honed, razor sharp edge; a wicked sawback; and a bitter point that's gracefully up-swept for added penetration intensity. At an imposing 9 3/4" long, this beast of a blade is undeniably equipped to take on the biggest chores. What's less apparent - based on appearance alone - is the Iron Phantom's fine dexterity and remarkable knack for yielding a light, delicate touch, when warranted. The knife's generous finger choil, ergonomically contoured handle and ideal overall weight distribution, together, provide the extraordinary level of control necessary for such a broad utility range. Like the rest of the knife, the synthetic handle opts for function over fashion, boasting near-infallible durability and clean, practical form. Ribbing on the handle affords a no-slip grip, while thumb grooves and a shrewdly engineered profile boost comfort and reduce fatigue during especially vigorous, extended use. There are no brass spacers, abalone overlay, file-worked bone or other ornamentation. But what the Iron Phantom lacks in frills, it more than makes up for in dependability and performance. This is no display piece. 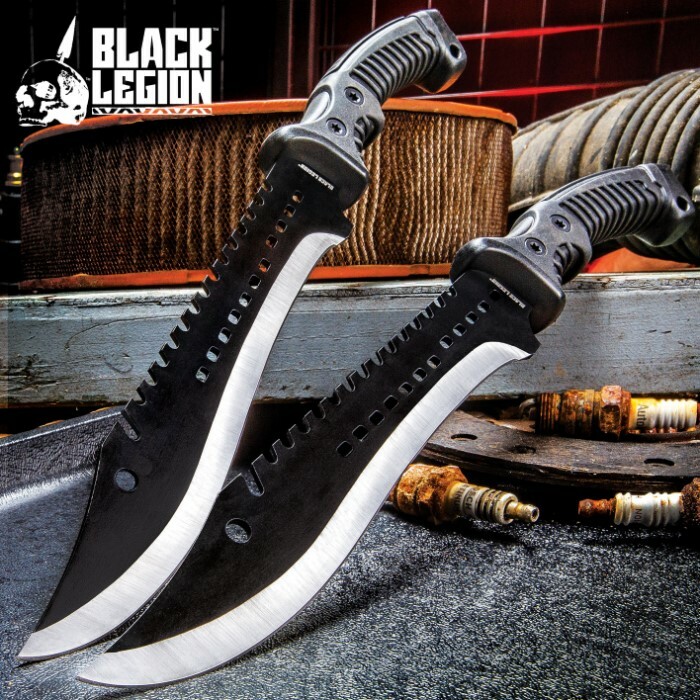 Black Legion's Iron Phantom Bowie is built for hard work, plain and simple. So bring on the mud, bring on the grime! I like the Iron Phantom Bowie. Very sharp blade and the price,with free shipping,is a bargain.